Well I did it: I’ve bought a 13″ MacBook. Its size and portability won me over. So far, it’s been pretty smooth: I had no problems setting up my mail accounts in Mail, and it connected to my home wireless network effortlessly. On the other hand, I had to search the web to find out what the Mac equivalents of the Home and End keys were. The next step for me is to get acquainted with a whole new set of programs. For now, I’ve decided to use iWork ’09 for my office suite, which can import and export Microsoft Office files. For those tricky files that iWork can’t handle, I’ll install Windows Vista and Office 2007 in another partition, and then run them inside Parallels Desktop. For photos, iPhoto would be fine, except I’ve built up years of metadata inside Adobe Photoshop Elements on Windows, which iPhoto can’t read. So I’m getting Adobe Photoshop Lightroom, which can import Photoshop Elements metadata and runs on both Windows and Mac. Lightroom isn’t cheap, but luckily I’ve accumulated enough reward points to pay for it. By the way, I’m still looking for a (cheap) image editor for the Mac, as well as blogging software, so I appreciate any suggestions. There is one Mac app I look forward to using: Delicious Library (no relation to the social bookmarking site Delicious). It lets you catalog your book and media collection, but instead of typing in all the data by hand, it uses the camera in your Mac as a barcode reader, and then automatically retrieves that data over the net. I’ve known about this app for years, and I look forward to actually being able to use it. Eventually, I’ll get around to doing what I said I’d do on my new Mac: create iPhone apps. 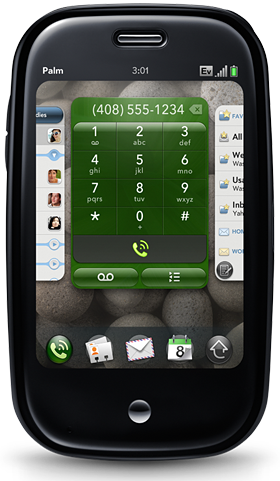 Today Palm announced its new smartphone, the Pre, and just as importantly, its long-awaited new software platform, WebOS. Reading the Engadget live blog on the announcement and watching videos on Gizmodo, I am quite impressed by what I saw. Not only is the hardware slick, the software is too. Wall Street liked it as well: on a day when the Dow Jones fell 0.31%, Palm’s stock shot up 35%. Alas, I have already switched from Palm to the iPhone, and at this point I don’t think I’ll be going back. But the smartphone market is still growing, and I’m rooting for Palm to make a comeback, if only to give the iPhone some much needed competition. Will it be enough? I’m not sure, but I am sure that if Palm hadn’t done everything it showed today, it would have been doomed.